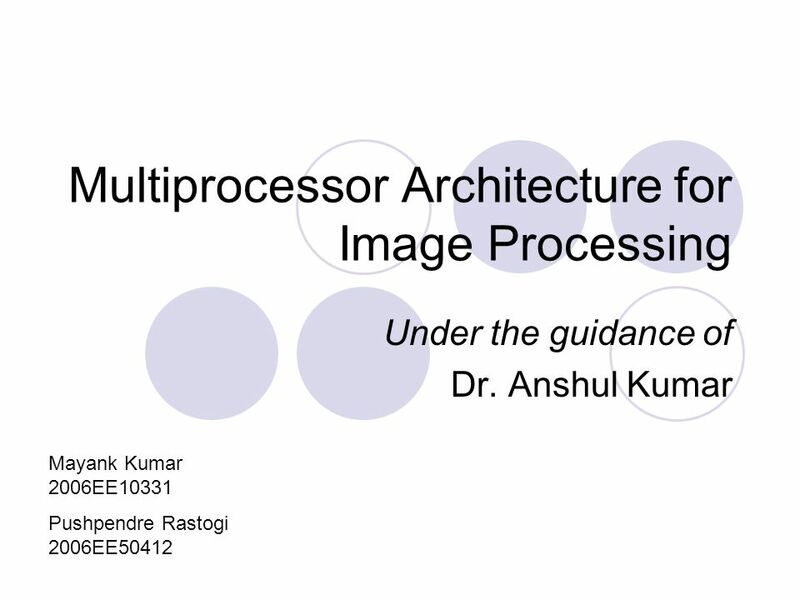 Multiprocessor Architecture for Image Processing Under the guidance of Dr. Anshul Kumar Mayank Kumar 2006EE10331 Pushpendre Rastogi 2006EE50412. 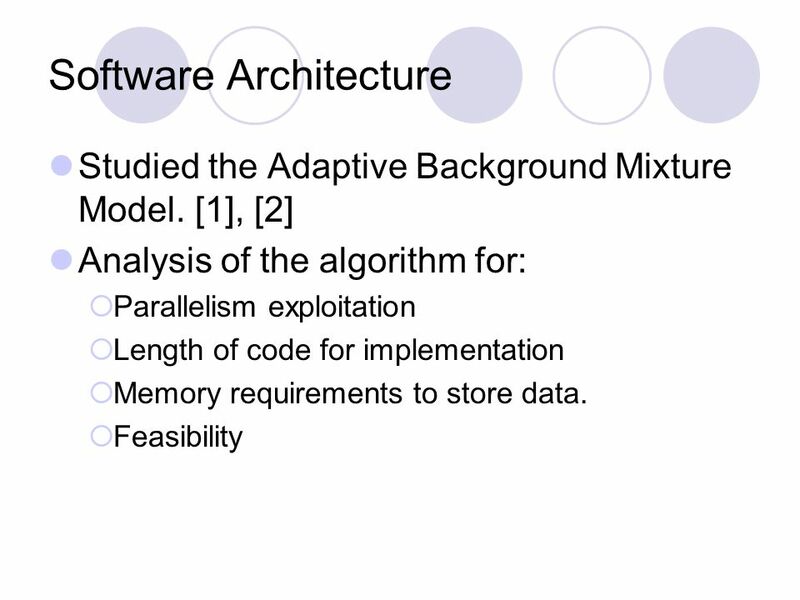 3 Introduction FPGA/Reconfigurable ASIC provide promising solution to the above problem by designing specific hardware utilizing the parallelism in algorithm. 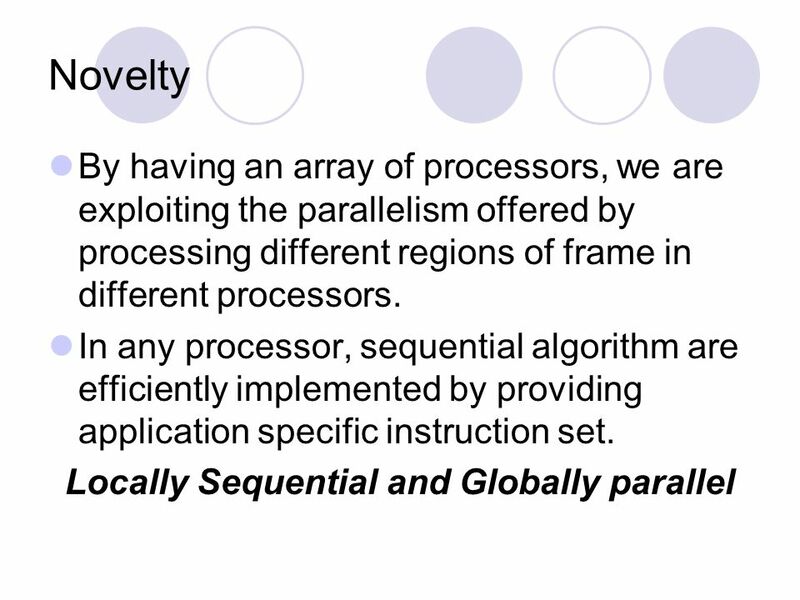 Though, there are many shortcomings Gates get used up when complex algorithm are implemented. 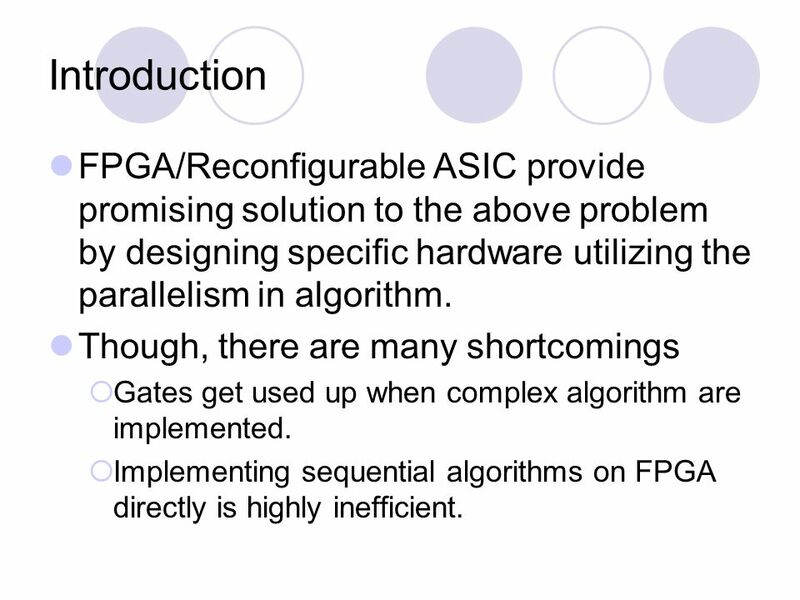 Implementing sequential algorithms on FPGA directly is highly inefficient. 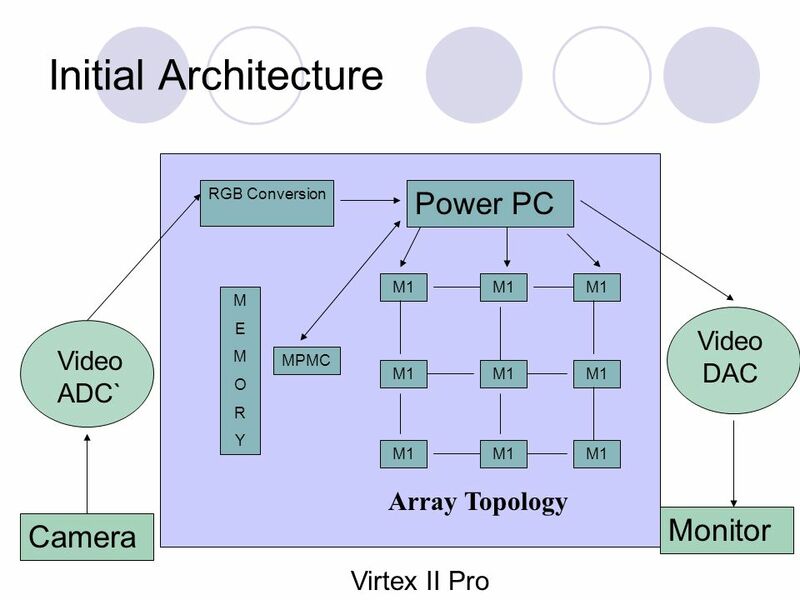 4 Our approach To design a multiprocessor architecture to facilitate the processing of high resolution image/video frames. 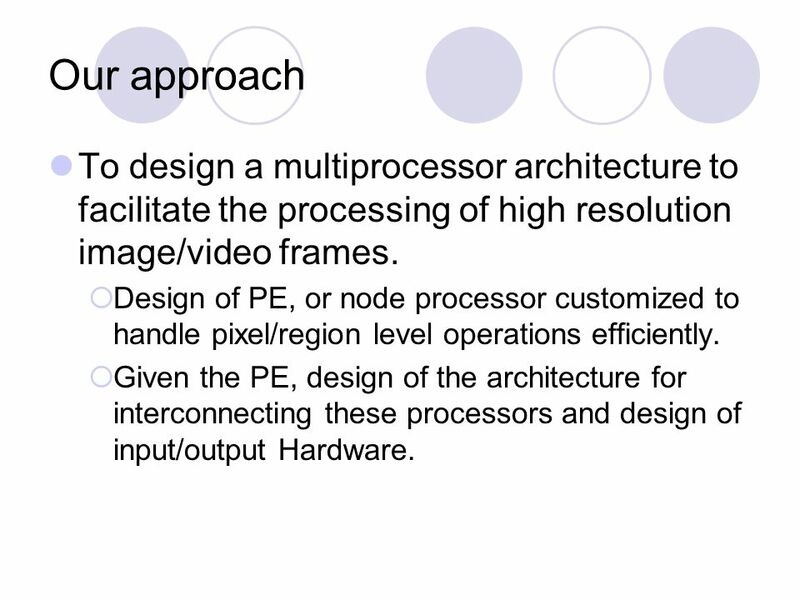 Design of PE, or node processor customized to handle pixel/region level operations efficiently. 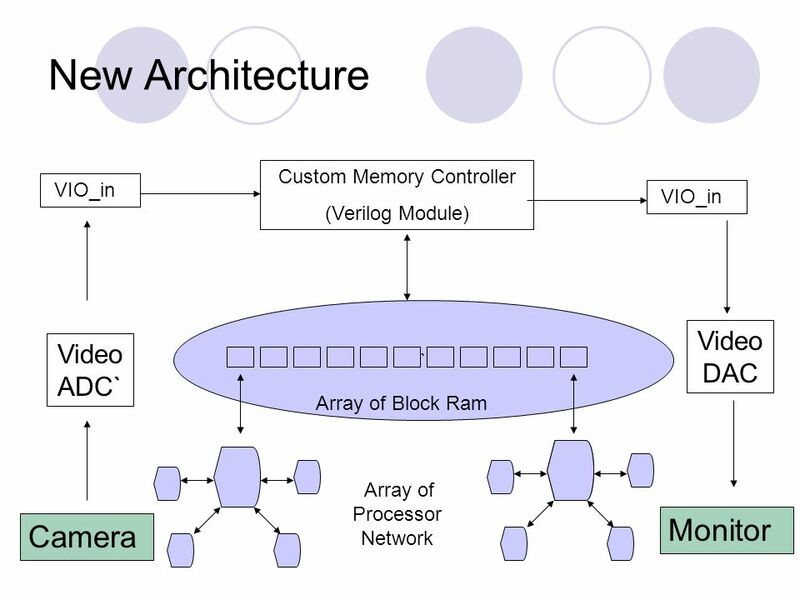 Given the PE, design of the architecture for interconnecting these processors and design of input/output Hardware. 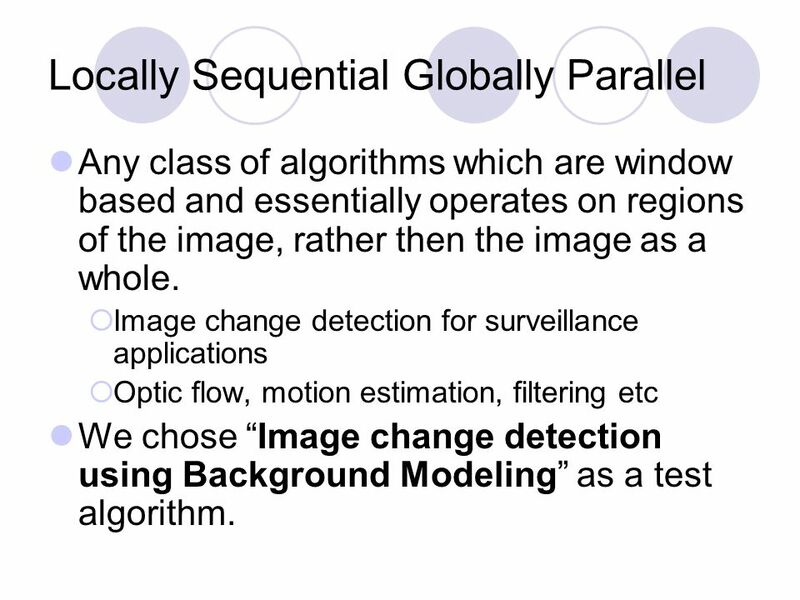 6 Locally Sequential Globally Parallel Any class of algorithms which are window based and essentially operates on regions of the image, rather then the image as a whole. 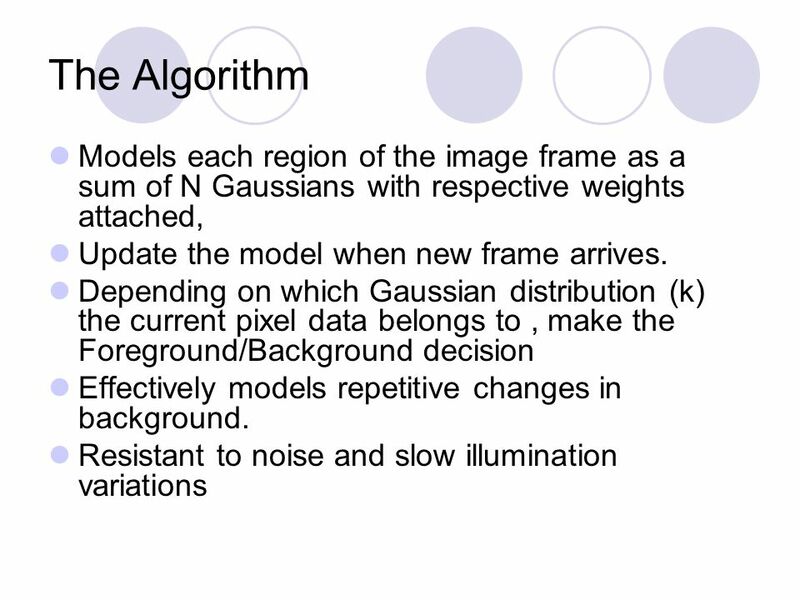 Image change detection for surveillance applications Optic flow, motion estimation, filtering etc We chose Image change detection using Background Modeling as a test algorithm. 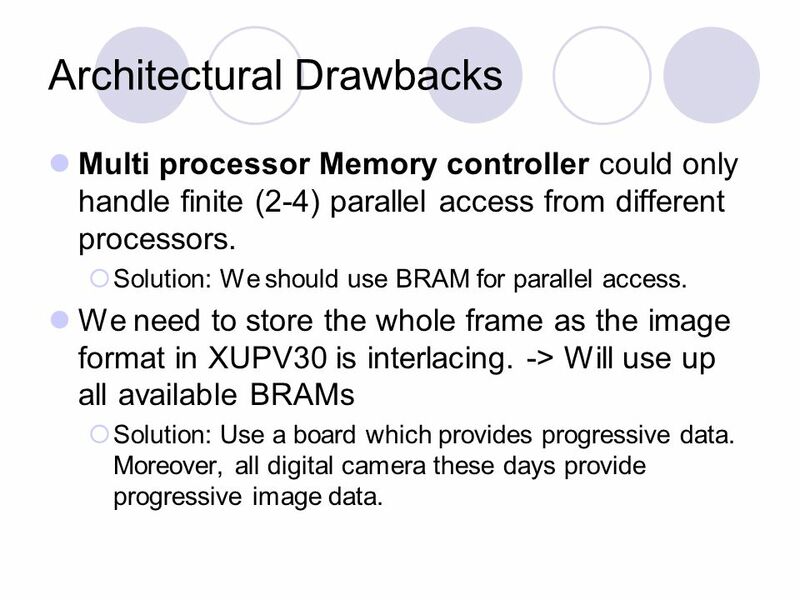 9 Architectural Drawbacks Multi processor Memory controller could only handle finite (2-4) parallel access from different processors. Solution: We should use BRAM for parallel access. We need to store the whole frame as the image format in XUPV30 is interlacing. -> Will use up all available BRAMs Solution: Use a board which provides progressive data. Moreover, all digital camera these days provide progressive image data. 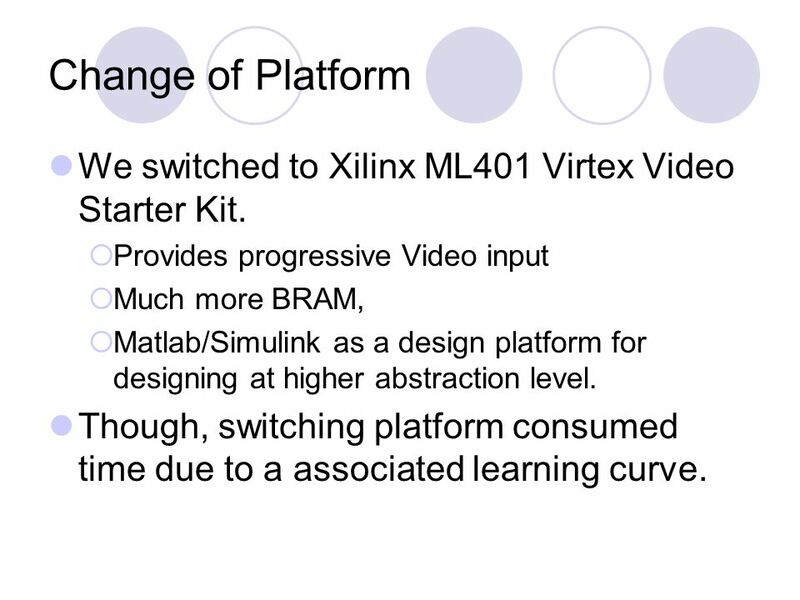 10 Change of Platform We switched to Xilinx ML401 Virtex Video Starter Kit. Provides progressive Video input Much more BRAM, Matlab/Simulink as a design platform for designing at higher abstraction level. Though, switching platform consumed time due to a associated learning curve. 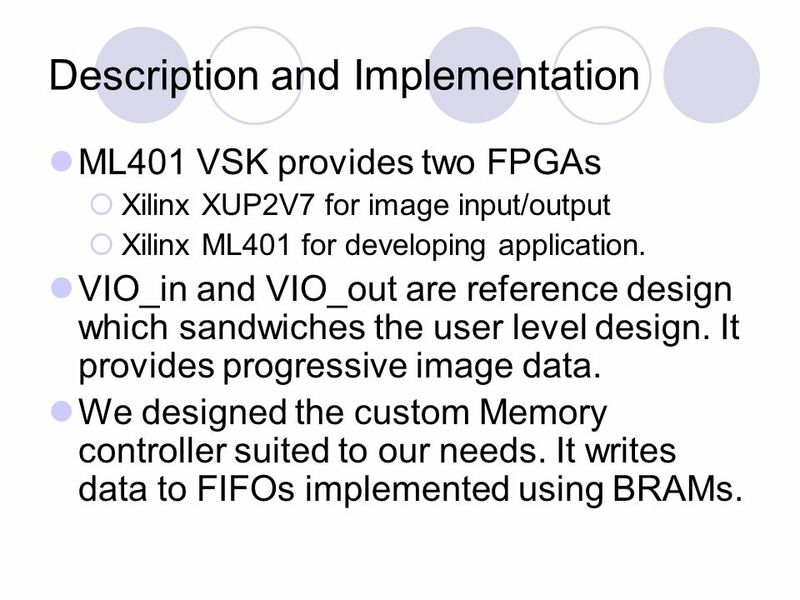 12 Description and Implementation ML401 VSK provides two FPGAs Xilinx XUP2V7 for image input/output Xilinx ML401 for developing application. VIO_in and VIO_out are reference design which sandwiches the user level design. It provides progressive image data. We designed the custom Memory controller suited to our needs. 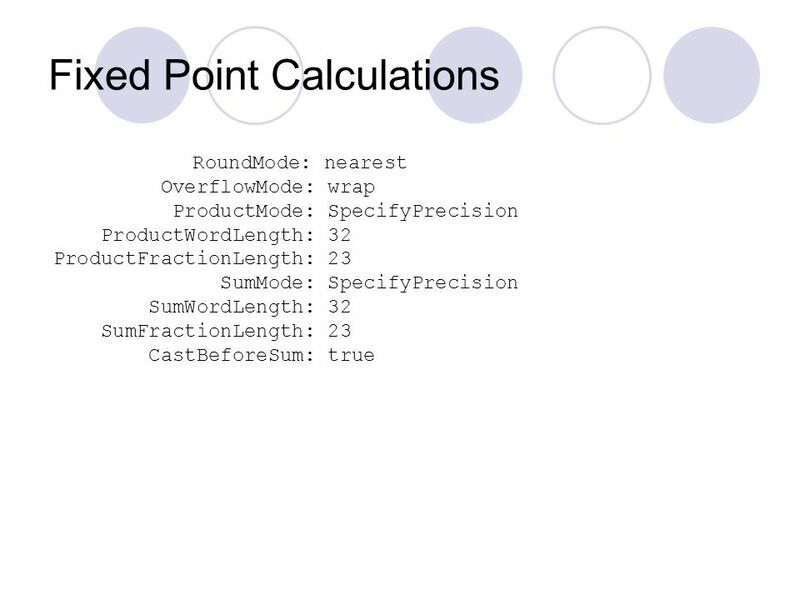 It writes data to FIFOs implemented using BRAMs. 13 Custom Memory controller Takes H_sync, v_sync, rst, Pixel_clk as input and selects a target FIFO to write the incoming data. Each BRAM stores Image data corresponding to 4 lines. It first empties the queue reading the result computed in the last iteration. 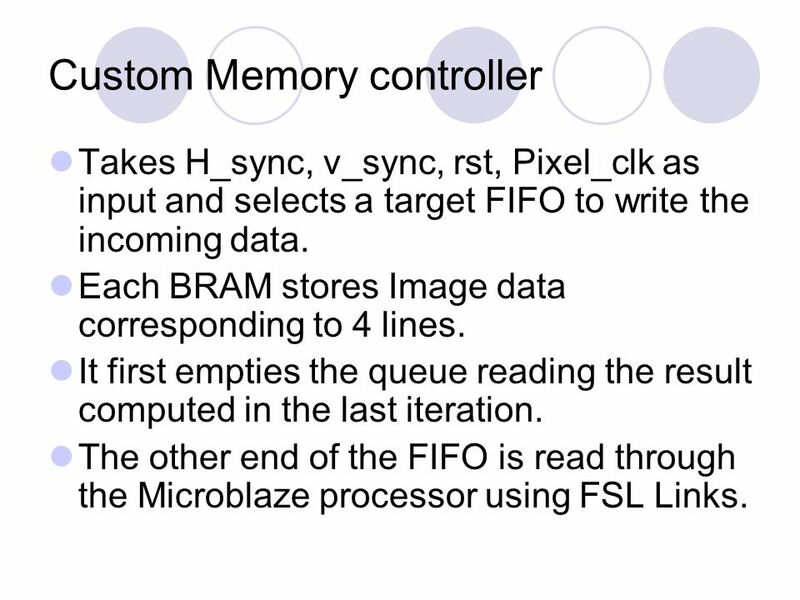 The other end of the FIFO is read through the Microblaze processor using FSL Links. 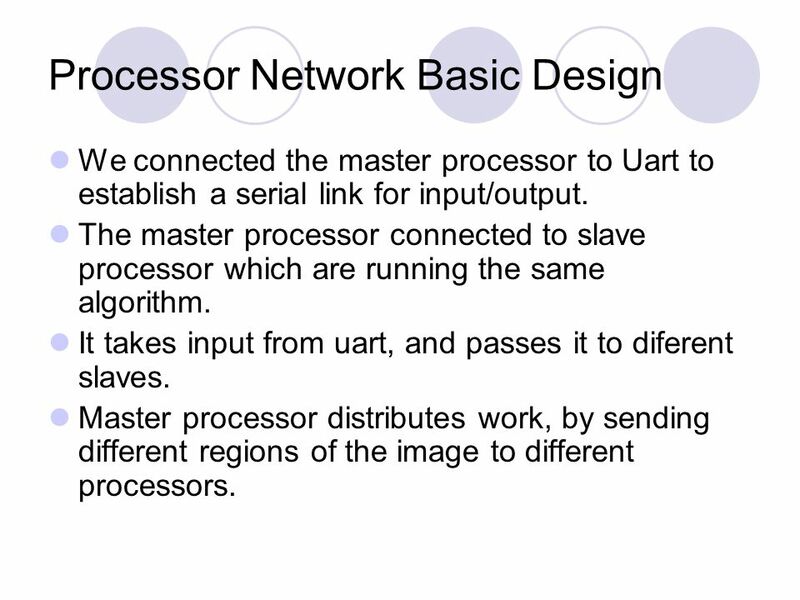 15 Processor Network Basic Design We connected the master processor to Uart to establish a serial link for input/output. The master processor connected to slave processor which are running the same algorithm. It takes input from uart, and passes it to diferent slaves. 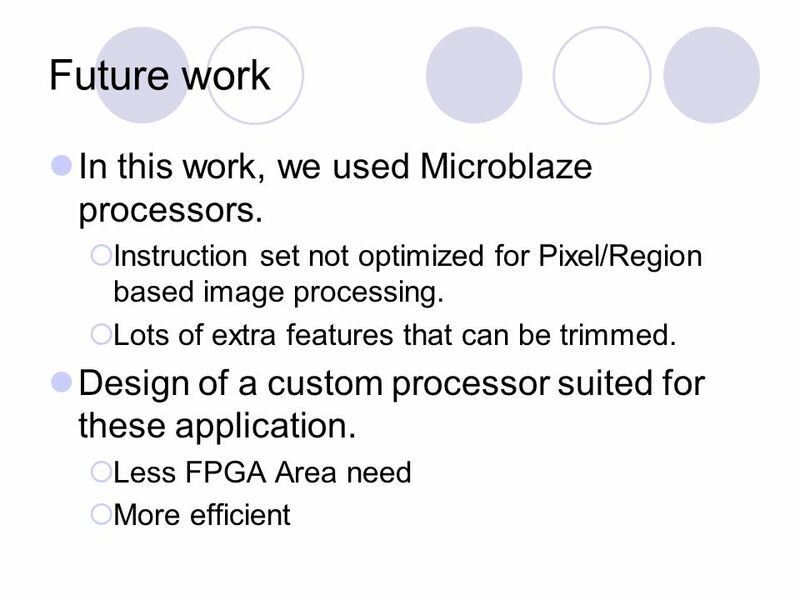 Master processor distributes work, by sending different regions of the image to different processors. 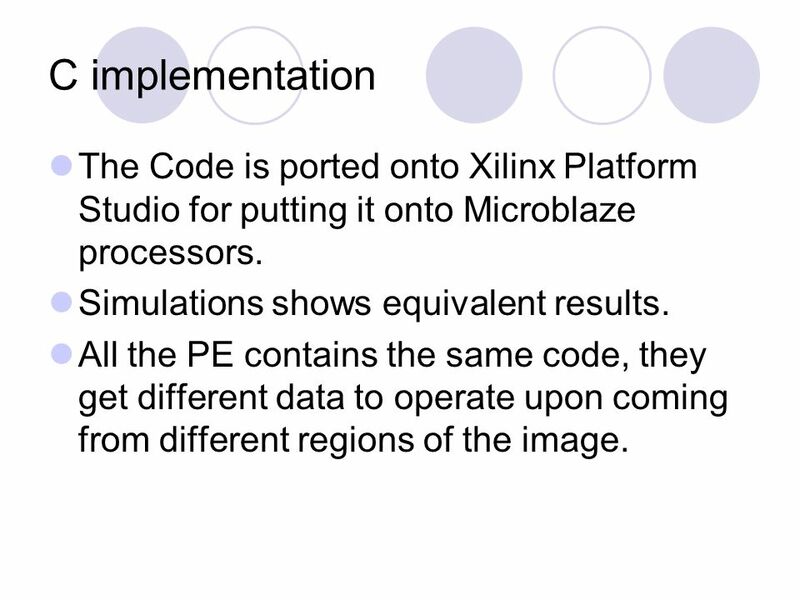 21 C implementation The Code is ported onto Xilinx Platform Studio for putting it onto Microblaze processors. 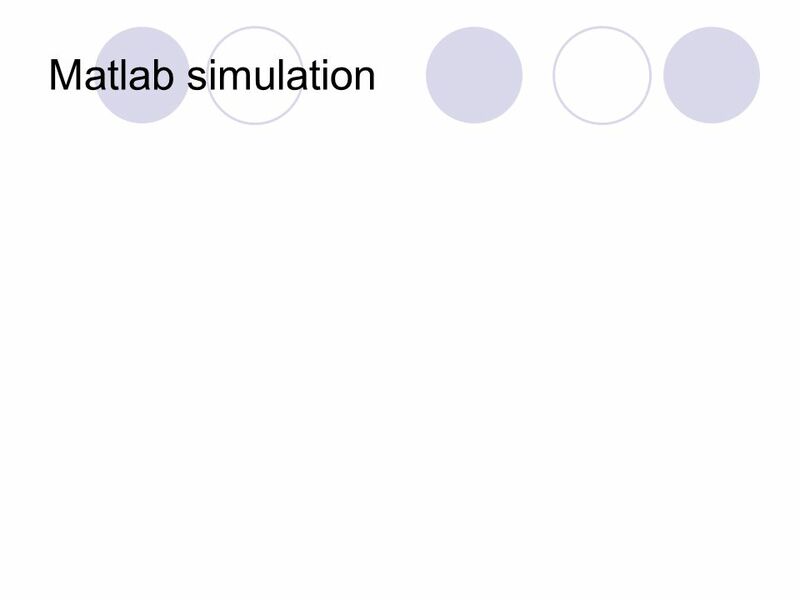 Simulations shows equivalent results. All the PE contains the same code, they get different data to operate upon coming from different regions of the image. 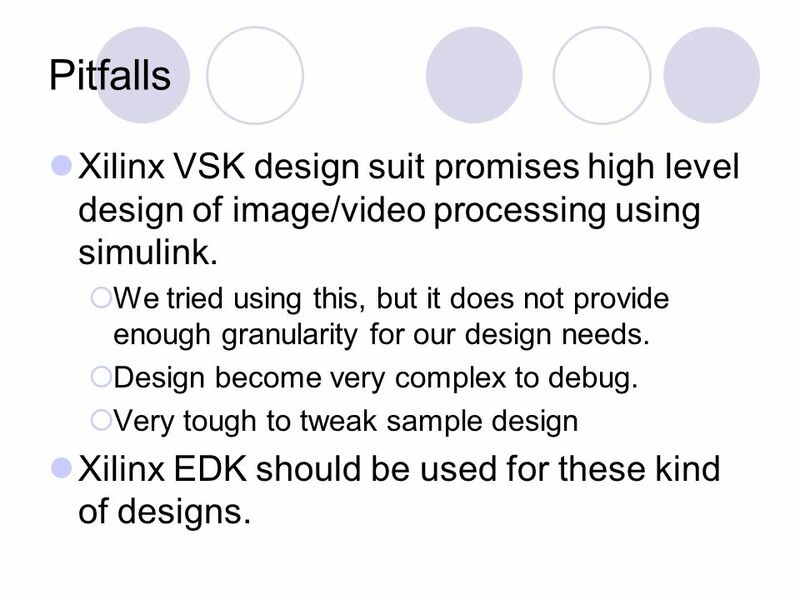 22 Pitfalls Xilinx VSK design suit promises high level design of image/video processing using simulink. We tried using this, but it does not provide enough granularity for our design needs. Design become very complex to debug. Very tough to tweak sample design Xilinx EDK should be used for these kind of designs. 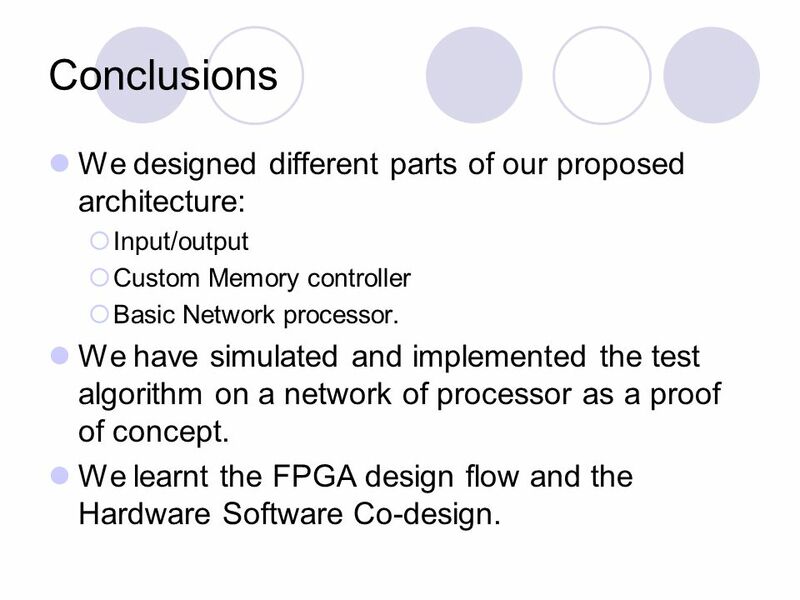 23 Conclusions We designed different parts of our proposed architecture: Input/output Custom Memory controller Basic Network processor. 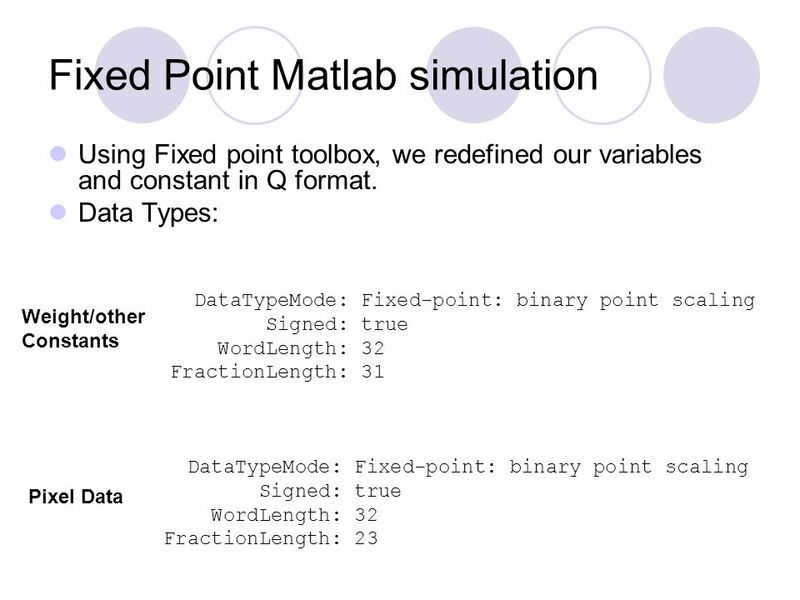 We have simulated and implemented the test algorithm on a network of processor as a proof of concept. 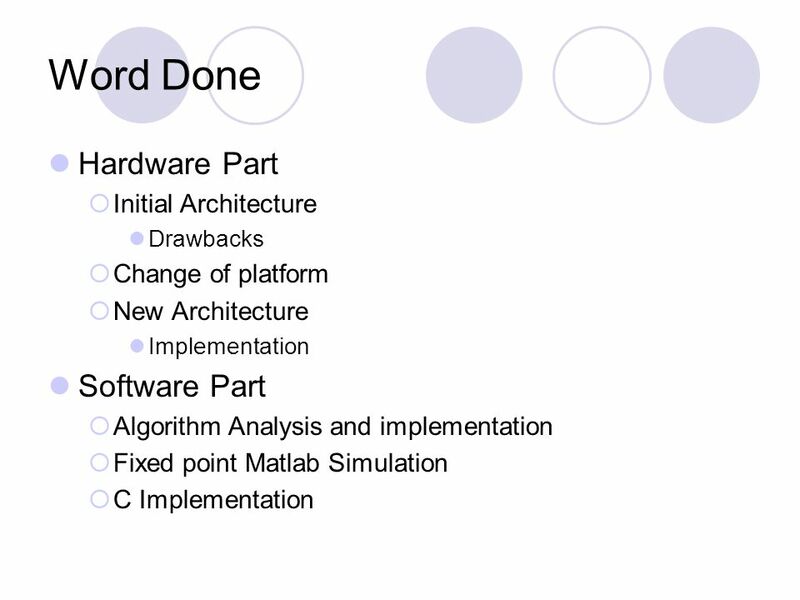 We learnt the FPGA design flow and the Hardware Software Co-design. Download ppt "Multiprocessor Architecture for Image Processing Under the guidance of Dr. Anshul Kumar Mayank Kumar 2006EE10331 Pushpendre Rastogi 2006EE50412." 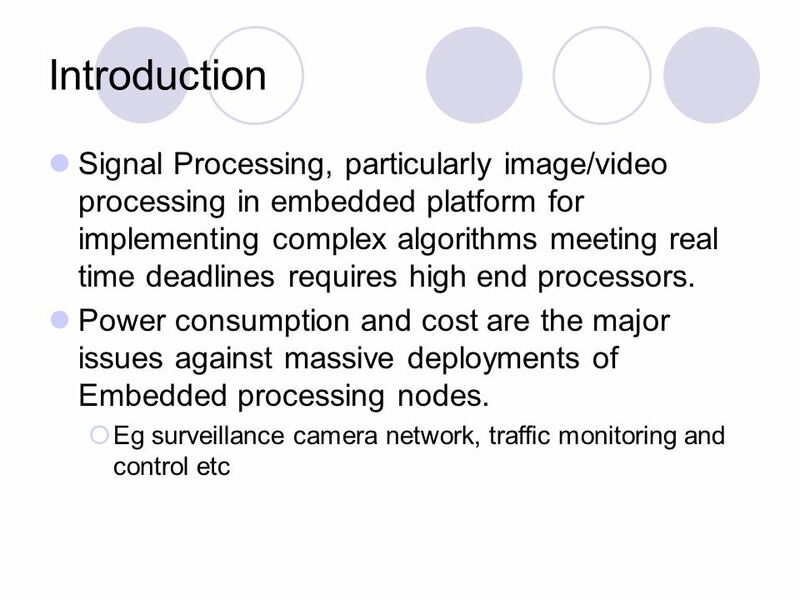 Multiprocessor Architecture for Image processing Mayank Kumar – 2006EE10331 Pushpendre Rastogi – 2006EE50412 Under the guidance of Dr.Anshul Kumar. StreamBlade SOE TM Initial StreamBlade TM Stream Offload Engine (SOE) Single Board Computer SOE-4-PCI Rev 1.2. Sumitha Ajith Saicharan Bandarupalli Mahesh Borgaonkar. Ultrasonic signal processing platform for nondestructive evaluation (NDE) Raymond Smith Advisors: Drs. In Soo Ahn, Yufeng Lu May 6, 2014.  Understanding the Sources of Inefficiency in General-Purpose Chips. 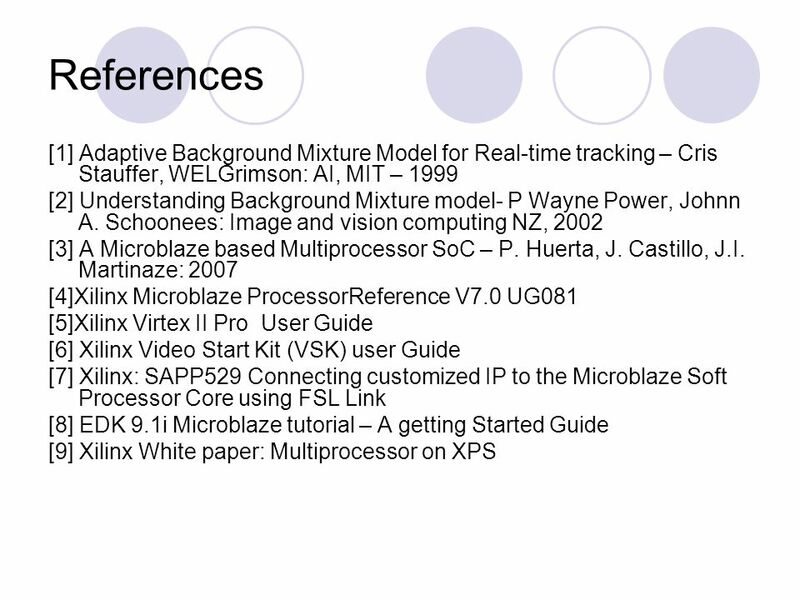 MotoHawk Training Model-Based Design of Embedded Systems. Motion Detection And Analysis Michael Knowles Tuesday 13 th January 2004. Team Morphing Architecture Reconfigurable Computational Platform for Space. BEEKeeper Remote Management and Debugging of Large FPGA Clusters Terry Filiba Navtej Sadhal. Department of Electrical and Computer Engineering Texas A&M University College Station, TX Abstract 4-Level Elevator Controller Lessons Learned. Hardware accelerator for PPC microprocessor Final presentation By: Instructor: Kopitman Reem Fiksman Evgeny Stolberg Dmitri. 1 Pupil Detection and Tracking System Lior Zimet Sean Kao EE 249 Project Mentors: Dr. Arnon Amir Yoshi Watanabe. MAPLD 2005/254C. Papachristou 1 Reconfigurable and Evolvable Hardware Fabric Chris Papachristou, Frank Wolff Robert Ewing Electrical Engineering & Computer.